I’ve always loved nonfiction. The how and why of things—any things—has always fascinated me. At the same time, I love a good story. Why, I’ve thought, do the two have to mutually exclusive. I thought it could be done, the combination of a great storybook and genuine nonfiction, but I just hadn’t seen it. I knew a really clever author/illustrator should be able to carry it off though. Then I saw Redwoods. It was just as I had imagined a story within a story yet something more. So much more. Authors like Jim Murphy, Russell Freedman, Sally Walker and others have honed the craft of narrative nonfiction to a fine edge. Jason Chin, however, has taken another step. He’s drawn an engaging story and linked it to a rock solid nonfiction text. Standing alone, either story or text would be more than passable. The illustrations, featuring a young boy who bears a striking likeness to my nephew, would make a good wordless book in the vein of Ann Jonas’s The Trek. The text on the other hand, is a clear and interesting explanation of the history and “life story” of California’s coastal redwoods and the importance of their place in their area’s eco systems. In an author’s note at the end of the book, Chin explains that his research and a trip to California “left (him) with an affinity for the redwoods that (he) hadn’t thought possible.” Having poured over his book numerous times and perusing my photos of the redwoods in Yellowstone, I understand exactly where he’s coming from. To top it off, the surprise at the end of the story will have readers anxiously awaiting more from Mr. Chin. The boy has left the wondrous Redwoods book on a bench and a girl has picked it up; what will happen now? Has Chin placed clues within the illustrations about his next book? There’s so much to see in the artwork that I don’t know for sure, but I think perhaps he may have. I hope we don’t have to wait too long to find out. Possibly even more amazing than a brilliant concept carried out flawlessly is the fact that this is author/illustrator Jason Chin’s first book. We can only hope that this debut book is merely the beginning of a long and illustrious career. This was a great sci fi book for kids. Mike is told about 8 hours before they are leaving that he is going to go live with his parents and sister on Mars. At the last minute, his sister is left behind. Almost immediately, Mike realizes that something fishy is going on. Suddenly, his mom has an assistant that looks a lot more like a bodyguard. Then, after a very garbled message from his sister, he finds out that his parents are trying to sabotage the ship! With the help of a very weird girl, Mike may just figure out what is going on before all is lost. Here’s a cute, new monkey story that I just couldn’t pass up. 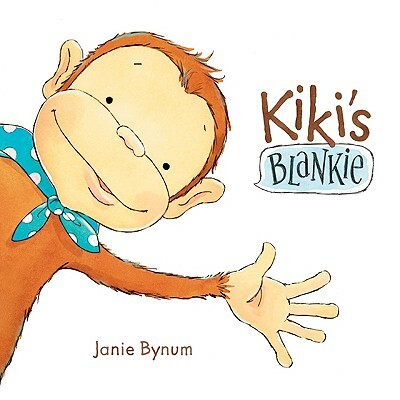 Kiki is a little monkey who adores her polka dot blankie. Whether it is going to the beach or playing pretend, she always has her blankie by her side. She uses it to sail the seas and fly through the sky. One day while using her blankie as a sail, it is blown away by the wind. Can Kiki get her blanket back or will a scary green crocodile gobble it up? The illustrations are adorable, especially the one of Kiki sitting in front of the dryer waiting for her blanket to come out. Kids will be able to relate to the importance of a much loved blankie – especially one that allows you to be anything. Would being able to fly change your life? It sure changed things for Thomas Top when the Fat Fairy granted a quickly made birthday wish. His flying adventures, from awkward to soaring, are illustrated with lively line drawings that add to the fantasy and fun. This story is sometimes combined with The Smallest Girl Ever in a flipable book called Magical Kids. Children in grades 2-4 who like these stories will find more lighthearted magic in another flipable book by Gardner: The Strongest Girl in the World and The Invisible Boy. 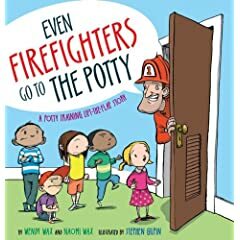 Are you ever curious if doctors and firefighters and baseball players go to the potty? If you are a 3 ½ year old boy you are, and so this “potty training lift-the-flap story” is just right for you. This book cleverly answers the question that only a child would ask — Does EVERYONE go to the potty? “It is opening day at the baseball stadium. “Batter up!” shouts the umpire – but the batter is nowhere in sight. Where did he go? To the potty! . . . Even baseball players go to the potty.” The story continues by wondering about construction workers, astronauts, train engineers, and even zookeepers. What a funny and entertaining book for little boys (and girls), and fun for moms too. It is never easy to move away from your friends and familiar surroundings. Alice Moxley and her parents move from Chicago to Mississippi because of her father’s job. He is an FBI agent and has been assigned to protect black people who are registering to vote. The year is 1964. Alice very quickly discovers that life in Mississippi couldn’t be any more different from life in Chicago. First, there are the southern accents that are so very hard to understand. Then, there are the ways certain people are treated – like they just don’t matter. 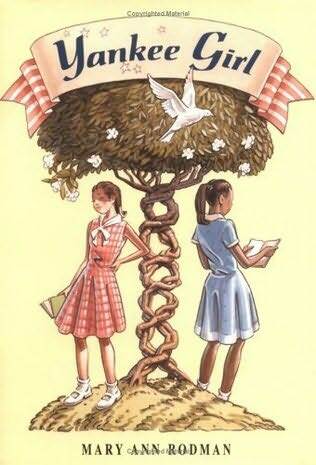 Finally, there is racial tension everywhere, but it is especially felt in Alice’s new school when the first two black students begin the integration process. Alice wants to fit in with her new classmates, yet finds it hard to adjust and make friends. She is called Yankee Girl because of her accent and her ‘up North’ ways of thinking. She finds herself torn between trying to fit in with the popular girls, who are the Cheerleaders, or following her heart and befriending the only black girl in her class. She chooses to try to be one of the popular girls. Even after they play a mean trick on her, she still wants to fit in. Only after tragedy strikes, does Alice realize the importance of listening to her own heart instead of following along with everyone else. This book begins with the funeral of Grace Cahill and the reading of a most unusual will. Grace leaves either one million dollars to each of her living relatives or a clue. If they choose the clue, they become part of a race to discover “the most important treasure in the world” which will make them “powerful beyond belief…” Most of the family members in the room choose to become part of the game including Dan and Amy who are Grace’s grandchildren and orphans. The children decide that a race around the world to find clues to a treasure is far preferable to staying with their guardian whom they dislike. The game begins even before the children get out of Grace’s mansion. Their clue leads them to a secret room but while there the mansion is set on fire. They barely escape with their lives and looking back at the burning mansion, they see a strange man in black who was not at the funeral running from the fire. The race is on and it will take them to the catacombs in France and pit them against ruthless family members who are determined to gain the prize themselves and to thwart the siblings attempts. The author of this first book in the series is the creator of the wildly popular Percy Jackson series. It is a very different series because each book is going to be written by a separate author. Another fun thing about the series is that you can not only read the books but you can be part of the game! You can collect clues and win prizes. 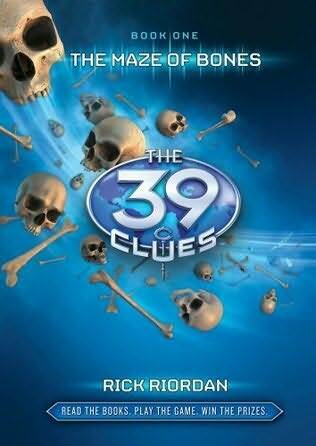 There is also a website which you can visit which has games and clues: www.the39clues.com. Check it out!